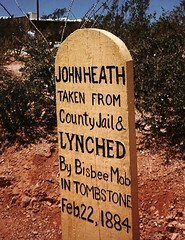 Tombstone is one of those great little towns where they capitalize on their bit of history. What makes it so wonderful is that while they're trying so hard to restore and commercialize, they actually create this little community where everybody knows everyone else. They're polite, friendly and utterly content in their small corner of the world. The re-creation of the OK Corral, while not spectacular, is something that you just have to see if you come to visit. Chipped statues of Doc Holliday, the Earps, the Clantons and McLaury pose in the places where the actual gun fight occurred. If you press a button on a nearby building, the rusty voices of actors re-enacting the 30-second fight can be heard. They don't pull any punches in Tombstone, the last remaining Crib (a prostitute's office space) stands nearby with the pertinent facts (the cowboys didn't take their boots off, it took too much time). The Bird Cage Saloon features one of the infamous Fiji Mermaids and a hearse that carried hundreds of Tombstone residents to Boot Hill Graveyard. They tell you that Doc Holliday was a drunk and the streets are adorned with little signs that say things like "Jake Louse was shot dead on this spot." 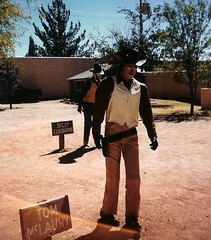 Tombstone is where our "World's LARGEST and smallest" obsession began. Tombstone is the proud home of the World's LARGEST Rosebush, which of course we had to see. Many more LARGE, small and unusual sights were still to come.